BUENOS AIRES, Argentina (AP) — Some fans and players want him to reconsider. Other supporters on Monday were simply sad that Lionel Messi says he's quitting the Argentine national team. Messi shocked his native country with his abrupt resignation from international soccer after Chile defeated Argentina 4-2 on penalties after a 0-0 draw on Sunday. "The national team is over for me," Messi Told the Argentine network TyC Sports. "It's been four finals, it's not meant for me. I tried. It was the thing I wanted the most, but I couldn't get it, so I think it's over." Messi lifted Argentina's first penalty kick over the crossbar, setting the stage for another loss in a final. Messi and Argentina lost to Brazil in the 2007 Copa final and to Germany in extra time in the 2014 World Cup final. They lost last year's Copa final to host Chile on penalty kicks after a 0-0 draw. "I imagine it was a very hard blow," Barcelona teammate Gerard Pique said. "I know how competitive he is. He will recover from this." Messi moved to Barcelona in 2001 when he was 13, producing lots of hardware for the Catalan club. But many fans at home have criticized him for not leading the nation to a World Cup title, as Diego Maradona did in 1986. "On top of everything, I missed the penalty kick," Messi told TyC. "I think this is best for everyone. First of all for me, and then for everyone. I think there are a lot of people who want this, who obviously are not satisfied, as we are not satisfied reaching a final and not winning it." Fans gathered outside the downtown office of the Argentine Football Association, many torn by Messi's promised departure. "I feel an enormous sadness, it tears my heart in two," said 29-year-old Juan Pablo Pinasco. "It was the cup that he (Messi) had to win, more than anything it is something that he deserves and I just don't want him to leave the national team." Another Argentine was more critical of Messi. "He is the best, he is the best outside (of Argentina) but he just has no luck here," Guido Stanchi said. "That's it, he's got to go. The team doesn't help him. Now there has to be a change. Let some new players come, ones that have a bit more will." Sergio Romero, Argentina's goalkeeper, said Messi spoke in the heat of the moment and he wants him to reconsider. "It's sad because once again a beautiful chance slipped away," Romero said. Without mentioning Messi's decision, Argentina President Mauricio Macri said on Twitter "that despite the sadness, we are very proud of the national team. They are great players." Nicolas Russo, the president of the Argentine club Lanus, said the Argentine Football Association will try to change his mind. "He has to stay," Russo said. 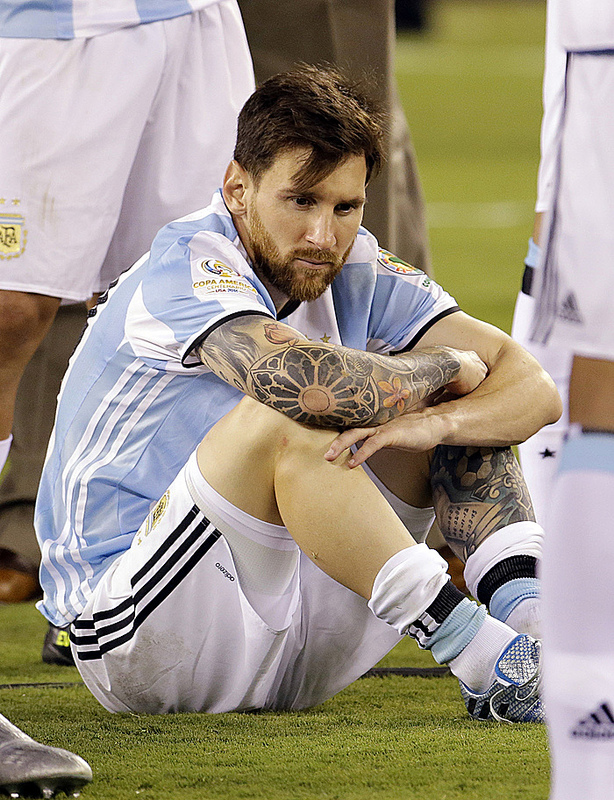 Messi was speaking in the aftermath of the emotional defeat and could change his mind. The team was to arrive later Monday in Buenos Aires, where Messi is sure to be mobbed by reporters. Argentina's next competitive match is a World Cup qualifier against Uruguay in September, and the top-ranked Albiceleste are considered among the early favorites to win the 2018 World Cup in Russia. Argentina won the World Cup in 1978 and 1986, but took its last major title in 1993 with the Copa America championship. Messi, who turned 29 on Friday, won under-20 and Olympic (under-23) titles with Argentina. He has led Barcelona to four Champions League and eight Spanish league titles, scoring 453 competitive goals in 531 games, including a La Liga-record 312. He is the national team's career leading scorer with 55 goals in 113 international appearances. "That's it, I've already tried enough," he told TyC. "It pains me more than anyone not being able to be a champion with Argentina, but that's the way it is. It wasn't meant to be, and unfortunately I leave without having achieved it."